Your Jazz Combo can be one player to six – piano, sax, rhythm section and/or vocals! R.A.O. Jazz Combos can be anything you want them to be…background music at your Brunch or Open House, Fine Dining accompaniment or the main musical entertainment at your Fundraiser or Charity Event. So, whether it’s a cocktail hour, art gallery showing, or private party, live jazz and R.A.O. Jazz Combos will elevate your event to a warm, elegant and memorable evening. From classic jazz to modern, contemporary and original tunes, we’ve got you covered. 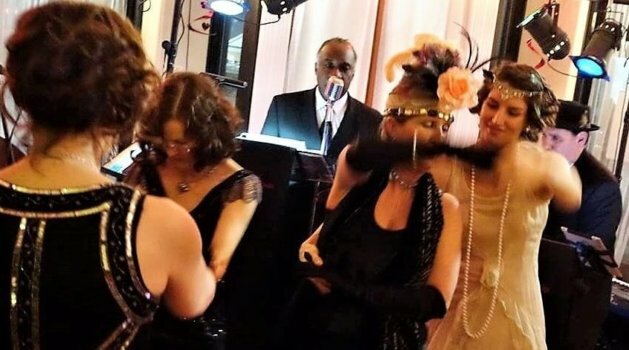 We pride ourselves on being an easy, one-stop shop for all of your music needs, and we’re here to handle all the details for your private party music, live corporate event music, wedding reception music, arts and theater music or fundraiser and charity event music. A typical event includes live music over a 4-hour period, with breaks arranged around your event schedule. During breaks, we are happy to play the background music of your choice over our PA system. You can also use our PA to make your own announcements or request that we provide Emcee duties for you. And, as important as the music is, we also pride ourselves on the personal attention we give you and your event. We have fun making it all about you and being easy to work with. We want to know your vision and your priorities – and how we can help make it happen. RAO Jazz is one of the most reputable band organizations in Atlanta and your one-stop shop for live music! Our simple process includes an easy-to-read Contract (no double-speak), an Event Details Form and a super friendly Cancellation and Refund Policy – because we know life gets complicated. 4 Sit back and relax! To guarantee your date, we encourage you to book the band(s) early, and submit your Contract along with your Deposit. We want to get to know you and your event. Because our job is to make your event lots of fun — and we take your fun pretty seriously. See the performance schedule for all the different bands. © 2019 R.A.O JAZZ All rights reserved.